An outstanding all-around athlete in college who lettered in four sports, Ratterman primarily backup up quarterbacks Frank Dancewicz and Johnny Lujack. He signed with the Bills in 1947 and passed for 1840 yards and 22 touchdowns, although with an AAFC-high 20 interceptions, as a rookie. He followed up in ’48 by throwing for 2577 yards and 16 TDs, again topping the league with 22 interceptions. Not averse to taking risks, Ratterman was an accurate passer with good ball-handling skills and sound leadership qualities. Bills went 5-5-2 to finish fourth in the AAFC. Lost AAFC First Round playoff to Cleveland Browns (31-21). 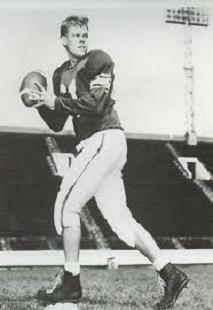 With the demise of the AAFC, Ratterman joined the New York Yanks of the NFL in 1950 and led the league in both TD passes (22) and interceptions (24) while throwing for 2251 yards, which ranked second. He jumped to Montreal of the CFL in ’51 but re-joined the Yanks at midseason, although with far less impressive results. Ratterman spent the remaining five years of his NFL career with the Cleveland Browns, where he backed up star QB Otto Graham. Given the opportunity to start in 1956, he lasted four games before suffering a career-ending knee injury. Overall, Ratterman passed for 10,473 yards and 91 touchdowns while giving up 96 interceptions, with 6194 yards and 52 TDs with 55 INTs coming in the AAFC.